Known as Octavius (or Octavian) until he was 35, in a divisive civil war, Caesar defeated Mark Anthony to become the undisputed leader of the new Roman Empire and he ruled from 27 BC until his death in AD 14. Caesar was one of the most influential leaders in world history, setting the tone for the Roman Empire and left a profound legacy on Western civilisation. He was born Gaius Octavius Thurinus in 63 BC to an aristocratic Roman family. His maternal great-uncle was Julius Caesar. When Octavius was four years old, his father died and he was later raised by his grandmother – Julia, the sister of Julius Caesar. Octavius became close to Julius Caesar – the dictator of the Roman Empire, and impressed by his young relative, Julius Caesar named Octavius as the main beneficiary of his will. On becoming the adopted son of Julius Caesar, he took the new name of Gaius Julius Caesar. On 15 March 44 BC, Julius Caesar was murdered by Brutus and a collection of Roman senators fed up with Caesar’s dictatorship. However, far from bringing peace, the assassination sparked civil unrest with Octavius leading the Second Triumvirate of Mark Anthony and Marcus Lepidus in defeating the assassins of Caesar. However, although Gaius was now the adopted son of Julius Caesar, his position was still weak. The second Triumvirate soon broke down with Mark Anthony wishing to consolidate his power. Octavius successfully convinced Julius Caesar’s own army to follow him and also divisions from Anthony’s own army. This enabled him to gain support from within Rome. Influential figures in the Roman Senate saw Octavian as the lesser of two evils compared to Mark Anthony – who was viewed with suspicion by many in Rome. 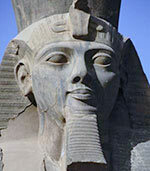 Mark Anthony became infatuated with Cleopatra and spent time absent from Rome, this increased suspicion of Mark Anthony and helped Octavian gain more support. In 31 BC, Octavian defeated Anthony and Cleopatra at the Battle of Actium. After Anthony and Cleopatra committed suicide, Octavian had Cleopatra’s son Ceasarion killed. This left Octavian as the undisputed leader of the Roman Empire. A grateful Roman Senate gave Octavian unprecedented powers – as leader of the army and domestic power. 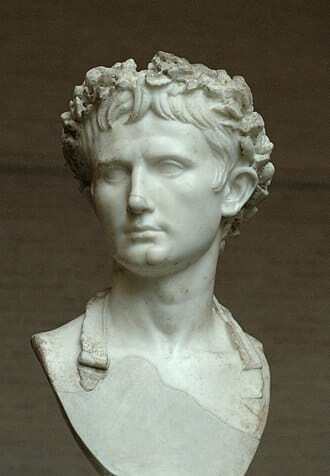 At this time he took the name ‘Augustus’ which meant ‘lofty’, and used the surname of his great-uncle Caesar. 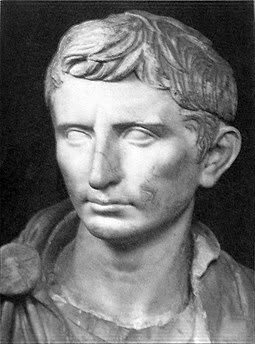 After pursuing a ruthless path to power which included complicity in the assassination of Senators, Augustus Caesar proved unexpectedly conciliatory, and the brutal civil wars and intrigue were left behind. He cut back on personal extravagances and was generous to the ordinary citizens of Rome. With the obvious failings of the Roman Republic, citizens were relieved to gain a benevolent dictator. Although a grateful senate was happy to give Caesar unlimited powers, Caesar agreed to keep the outer facade of the Senate and legislative assembly, but in practice, Augustus Caesar could rule with near-absolute power. Despite being incredibly powerful, he exercised his power with a degree of restraint and enlightenment. It marked the beginning of ‘Pax Romana’ – the near two centuries of relative peace, with the Roman Empire strengthening its power and influence over Europe. On a domestic front, Augustus embarked on an ambitious programme of investment in public infrastructures, such as roads, aqueducts and sewage systems. 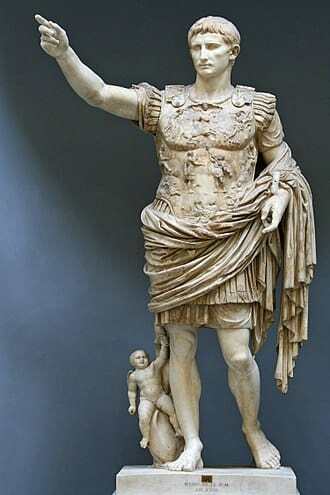 Augustus also founded the cities first police force and fire service. Augustus built many significant buildings in Rome. Augustus was also a patron of the arts and culture, supporting the leading poets of the day, such as Virgil and Horace. (Though he later banished Ovid after the poet criticised Augustus). Though not as charismatic as his great-uncle Julius Caesar, Augustus was a very successful political operator, harmonising disparate groups within Rome and skillfully promoting a carefully cultivated image. Caesar put his image on coins and the image of a powerful and benevolent ruler was widely diffused across Rome and the Empire. In foreign affairs, he sought to expand the frontiers of the Roman Empire and create standing armies to secure the borders against ‘barbarians’. These campaigns were successful in expanding the Roman Empire to include all of Spain, Egypt, Judea, Galatia and spreading northeast into Central Europe. The territory gained by Caesar made him one of the most successful military leaders, though he conducted most campaigns from Rome and engaged in little direct leadership himself. However, towards the end of his reign, there was increased resistance -, especially in Eastern Germany. One of his stepsons, who managed the campaign was killed, and this proved to be a region of continued resistance. Augustus died in 14 AD and power peacefully transferred to his adopted stepson Tiberius. Though Augustus never declared himself King – only princeps (first citizen) It was the start of an effective Royal dynasty – which was to rule the Roman Empire with different degrees of success. The era of relative peace and prosperity which Augustus helped to create enabled a synthesis of Roman, Egyptian and Greek culture. This Roman culture became deeply embedded into European culture. In turn, the strength of the Roman Empire would be a vehicle for the transfer of Christianity throughout Europe. Augustus would have been unlikely to hear anything of the Birth of Christ in Judea. Augustus was a patron of the traditional Roman religion and built temples and encouraged worship of the pagan gods. Citation: Pettinger, Tejvan. 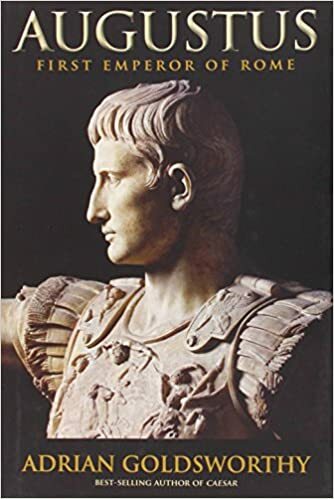 “Biography of Augustus Caesar”, Oxford, UK www.biographyonline.net, Published: 1 August 2018. Famous historical figures (throughout history) A list of the most famous figures throughout history. Includes, Buddha, Jesus Christ, Muhammad, Julius Ceasar, Albert Einstein and Constantine the Great.